The laws that explain how pizza gets uniformly cooked in an oven are not valid for systems of atoms at ultracold temperatures. A team of researchers at the Center for Theoretical Physics of Complex Systems, within the Institute for Basic Science (IBS, South Korea) has designed an innovative method to study how interacting particles behave at temperatures close to absolute zero, and found a situation where the laws of thermodynamics and statistical mechanics are not respected, energy is not evenly distributed, and equilibrium is not reached. Their findings are published in Physical Review Letters. Originally formulated by Gibbs, Boltzmann, and Maxwell, statistical mechanics seeks to find patterns in the chaotic behavior of a large number of particles, considered both collectively and as individual components. These are also the basic laws that describe why pizza warms up evenly in an oven, and ice cream does not melt in a freezer. Each of these examples has to do with the distribution of energy (heat) within systems over time. Equilibrium is reached when energy is distributed uniformly. These laws, however, have limitations, as illustrated by the Kolmogorov-Arnold-Moser (KAM) theorem. "The only well-known case of violation of these laws is KAM theory, but it ceases to work in systems with large numbers of interacting particles, technically known as many-body systems. The big question is whether all many-body systems obey the rules of equilibrium statistical mechanics, or not," explains Carlo Danieli, one of the authors of this study. In this study, IBS scientists observed a system that is out of equilibrium, independent from the number of particles. 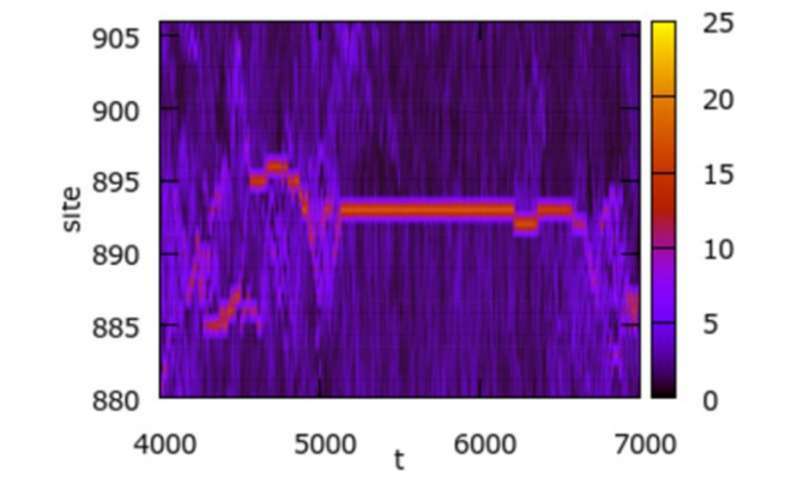 The method developed by the team addresses the collective dynamics of ultracold atoms in a standing wave field of counter-propagating laser beams. Such atoms form a single collective state, known as a quantum Bose-Einstein condensate. Led by Sergej Flach, the team performed an extensive statistical analysis of the dynamics of one of these systems, known as the Gross-Pitaevskii lattice. They observed a dynamical glass phase through the fluctuations in its energy distribution. Like a hypothetical pizza that does not heat up uniformly, but has cold and hot spots that change over time, the energy is not equally shared among the components of the Gross-Pitaevskii lattice. Instead, it shows fluctuations that violate the laws of statistical physics and thermodynamics. "We studied these fluctuations with our computer models, and predicted that in a limited time, the fluctuations will be extremely long lasting, infinitely long lasting, and that's when the system transforms into a dynamical glass phase," explains Danieli. "We expect that this method will pave the way to assess several other unsolved hot topics in condensed matter physics and beyond, e.g. anomalous heat conduction, interacting disordered systems, glasses, and spin glasses, among others," the team reported. IBS researchers are now applying this method of analysis to several fundamental models in the field of complex systems. The team aspires to demonstrate and establish the existence of a dynamical glass phase in a broad class of systems related to quantum mechanics and experimental physics: from superconducting Josephson junction networks to disordered Bose-Einstein condensates in higher dimensions. Flach says, "This work opens a new venue to assess phenomena related to weak ergodicity-breaking in a large number of classical and quantum many-body systems."